Peter Stone, Michael Quinlan, and Todd Hester. The Essence of Soccer, Can Robots Play Too?. In Ted Richards, editor, Soccer and Philosophy: Beautiful Thoughts on theBeautiful Game, Popular Culture and Philosophy, pp. 75–88, Open Court Publishing Company, 2010. Patrick MacAlpine, Mike Depinet, and Peter Stone. UT Austin Villa 2014: RoboCup 3D Simulation League Champion via Overlapping Layered Learning. In Proceedings of the Twenty-Ninth AAAI Conference on Artificial Intelligence (AAAI), pp. 2842–48, 4, January 2015. Daniel Urieli, Patrick MacAlpine, Shivaram Kalyanakrishnan, Yinon Bentor, and Peter Stone. On Optimizing Interdependent Skills: A Case Study in Simulated 3D Humanoid Robot Soccer. In Proc. of 10th Int. Conf. on Autonomous Agents and Multiagent Systems (AAMAS), pp. 769–776, 2, IFAAMAS, May 2011. Xiaoping Chen, Peter Stone, Luis Enrique Sucar, and Tijn van der Zant, editors. RoboCup-2012: Robot Soccer World Cup XVI, Lecture Notes in Artificial Intelligence 7500, Springer Verlag, Berlin, 2013. Peter Stone. 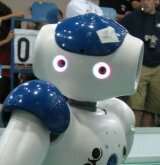 Intelligent Autonomous Robotics: A Robot Soccer Case Study, Synthesis Lectures on Artificial Intelligence and Machine Learning, Morgan & Claypool Publishers, 2007.